It has been said, somewhere, maybe at least once by no one in particular, “I’d rather have a bad scotch than a good gin.” We personally would rather just order a good scotch and a good gin, but some people I guess are just too particular. Perhaps with this customer in mind, Dry Fly Distilling decided to change it up and offer something unique with their own Dry Fly Gin: put it in a barrel and age it. And we will tip our hand early by stating that this little experiment worked rather well. Gin is typically distilled (or infused after the fact) with botanical aromas that center around the juniper berry. You find floral, perfumed aromas like lavender, clove and pine in your glass. Not typically consumed neat, or, by itself, you would commonly use Gin as a mixer in a number of drinks. Dry Fly Barrel Reserve Gin is an attempt to add some character by aging it in oak barrels to make it stand alone in a glass. This is not a long aging, and there are only a small number of barrels maturing their Gin at the moment, but what we have found is that the oak has added already more aromas and character. But most importantly, the oak has mellowed the Gin rather well. After all, gin is still a raw, new make spirit. So, it’s tough to avoid the harsh congener compounds that are mellowed out in other aged spirits, thus making it a smoother sip. How did it turn out? 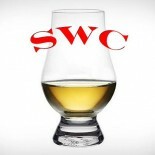 Your humble correspondents of the SWC offer our opinion on Dry Fly’s Barrel Reserve Gin…. Nose– The traditional aromas of juniper, pine, lavender and perfumed floral are here, but we also get spicy, tart green apples, apple pie and cinnamon. Taste– Sharp, sugary sweetness with tart oak. Hints of vanilla come through. Finish– Short, but underlying juniper with a burst of citrus (nice!). Comment– A drinkable, soft but contemplative sipping gin. Gentle sweetness with the traditional juniper all mellowed by the oak. It works well.